Chelsea is a New York City neighborhood located roughly west of Broadway. It stretches to the Hudson River and from West 14th to West 30th. Its 19th century industrial roots are blended with genteel townhouses now transformed into galleries, restaurants, parks, and markets. 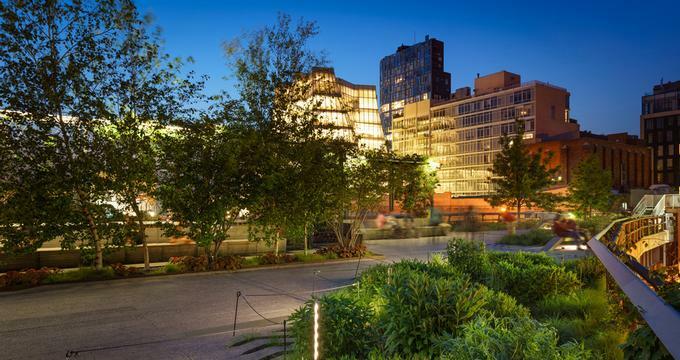 With Chelsea Market as its beating heart and High Line as a symbol of regrowth and reinvention, Chelsea has an interesting mix of eateries that range widely in their ethnic origins, price, vibe, flavors, and esthetics. When you step from the colorful streets of Chelsea to the opulent elegance of Del Posto, you will be transported to Old World Europe with mahogany bistro tables, rows of starched white tablecloths, and the soothing sounds of piano music. And then comes the food. You are in the hands of some of the world’s greatest food artists, so you should prepare yourself for a feast you will not soon to forget. Mario Batali, Joe Bastianich, Lidia Bastianich, and their partner and Del Posto’s Executive Chef Mark Ladner join forces to create what the New York Times has called “A Modern Italian Master” after giving it four stars, the first four-star rating they’ve given in 40 years. Their service is like a finely orchestrated opera, and the wine cellar is world class. Located next door to its parent the Lobster Place Seafood Market inside New York’s Chelsea Market, Cull & Pistol is known for its seasonal menu with incredibly fresh, diverse offerings from the Lobster Place. 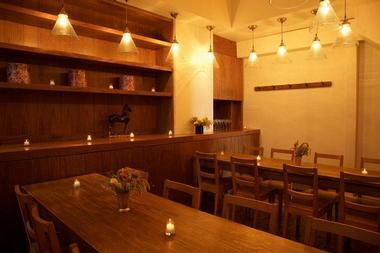 They also have an excellent wine list, great craft beers, and imaginative cocktails. Expect classics such as New England clam chowder but also more contemporary treats like Grilled Butterfly Bronzino. While the eatery is a sit-down establishment, it is clean and simple, with nothing to distract you from what is on your plate. They also offer take-out and delivery, so explore the options while you are there so you know what to get next. Located in the industrial chic space of a former Nabisco factory in Chelsea, Toro is a vast 120-seat tapas restaurant bringing the spirit of Barcelona’s lively traditional tapas bars to New York with an eclectic menu and a superb wine selection. The dining room is spectacular with 18-foot windows and high ceilings, though it still manages to feel inviting and comfortable. 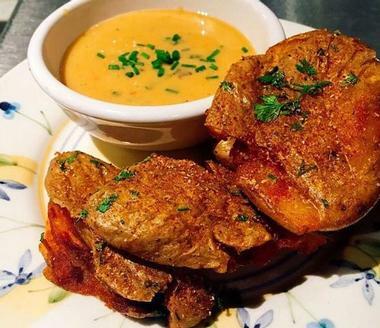 Chefs Oringer and Bissonnette focus on a mix of traditional and modern tapas, using fresh local ingredients to make authentic regional Spanish dishes. The tapas are flavorful and imaginative – try tripe with beans, blood sausage, and patatas bravas. There is a wine for every budget. The bottles are mostly from Spain with some exceptional vintages. Located in the lively, bustling Chelsea Market, Morimoto looks like it came from the future – it is sleek, streamlined, and thoroughly modern. This Japanese restaurant and lounge is where famous Iron Chef Masaharu Morimoto treats New Yorkers to his fantastic menu that includes much more than his spectacular sushi. You will find things like freshly made tofu sprinkled with truffles, Oyster foie gras and – wait for it – Kentucky Fried blowfish. There is also a trendy underground cocktail lounge with a sake sommelier and the tatami-covered omakase room. Prepare to spend a bit of money, as it is a high-end establishment. Located in Chelsea’s Ace Hotel, The John Dory Oyster Bar is a classy seafood restaurant with quirky, colorful décor and maritime paraphernalia such as a large mounted marlin. Sit on one of the brightly colored high chairs at the raw bar where all the action is and take delight in the freshest fare from the sea. Chef April Bloomfield has come up with tapa-like dishes that you might like even more than the oysters and clams. Try tiny mussels stuffed with spicy mortadella meatballs or squid stuffed with chorizo. Both options are divine. If you bring more than six people, you can get a special set menu at the chef’s table, in the kitchen, or in the dining room. Giovanni Rana Pastificio & Cucina is a true delight for all the senses. The large industrial space inside Chelsey Market has been transformed into a shrine to pasta: hanging from the ceiling are 400 cheese graters collected from Italian flea markets, hundreds of hand-made pots and pans, and, on the exposed brick wall, Mr. Giovanni Rana’s red vintage motorbike. But, what will really catch your eye are the rows and rows of pasta of all colors, shapes, and sizes. You can take it home or eat it on the spot, since this is a full-service restaurant, and fresh pasta is made daily in its on-site Pasta Studio. 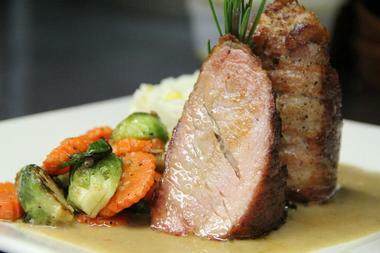 They use many imported regional and rare Italian products to give their dishes distinctive, original flavors. Chefs and owners Alex Raij and Eder Montero transport their guests to Basque country for a true Basque experience. This tiny rustic restaurant is inviting and full of Old World charm at the same time with rough wood on the walls, discrete lighting, and a magnificent native painting on the wall. The Basque region of Spain has a unique take on their food, which is characterized by simplicity in technique as well as ingredients. Humble peppers and beans play a role equal to that of aged Basque cheeses, local breads, fresh seafood, and unique Basque beef and lamb. 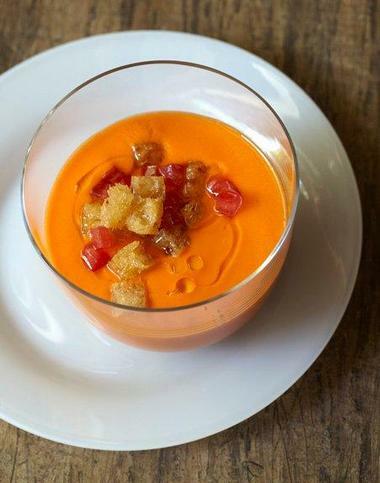 With old family recipes, fresh produce from the nearby Chelsea Market, unique Basque traditional glasses, and small plates that give you opportunity to experience a range of Basque cuisine, you are in for a special experience. Located in Chelsea’s Maritime Hotel, La Sirena is another ship in Mario Batali and Joe Bastianich’s fleet, an enormous, bustling Italian restaurant with two dining rooms, each seating about 120 people. Between them is a huge bar with an awesome 38-feet long marble bar top that definitely grabs your attention. There are also 150 more chairs on the terrace perfect for those balmy days. La Sirena is elegant and refined, and the food does not disappoint – the menu is full of tempting and mouth-watering choices. If you’re having hard time deciding, remember that with chef Batali pasta is an art form, so you might as well make a meal of it. 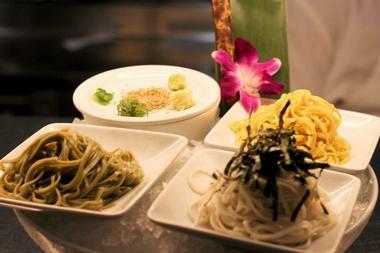 La Sirena offers two different pastas for one price. All you need with it is some good wine, and there is plenty to choose from. 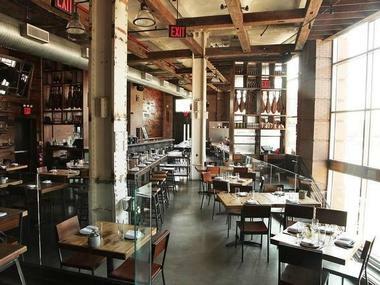 The Breslin is a British-style gastropub located just off the lobby of the Ace Hotel in Chelsea. It is warm, cozy, trendy, and packed with fashionistas and the city’s food connoisseurs, so expect to wait for a table even at 11 pm at night. Treat yourself with a craft beer from the rotating selection or a bartender’s special cocktail while you wait for the meatfest, the specialty of chef and owner April Bloomfield. The menu includes breaded and fried scrumpets and shredded lamb drenched with sweet mint vinaigrette. There is also fried cheese with gribiche and a deep-fried stuffed pig’s foot, easily shared by four. The pies with stilton, beef, and merguez sausages are to die for. There is live music on Sundays. Co., short for Company, is a 54-seat pizzeria and restaurant in Chelsea where James Beard Award winner Jim Lahey puts his own spin on classic pizza – round, thin, vaguely Neapolitan, and topped with inventive and unusual mixes. 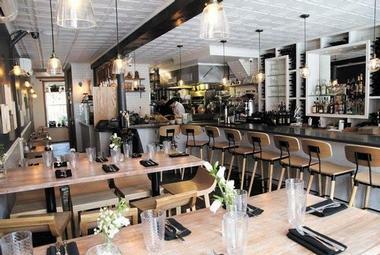 The restaurant is unpretentious with large, communal tables that invite sharing and conversation. Patrons can also sit at sidewalk tables when the weather permits. The pizzas are baked at about 900 degrees in a special wood-burning oven imported from Modena. While you will find good old classics like Margherita with buffalo mozzarella cheese on the menu, most pizzas are inventive concoctions like a frilly mushroom pizza with jalapeno, fresh dill, and three cheeses or pizza topped with zucchini-anchovy purée with zucchini blossoms. Lahey does not believe that tomatoes are necessary on pizzas. 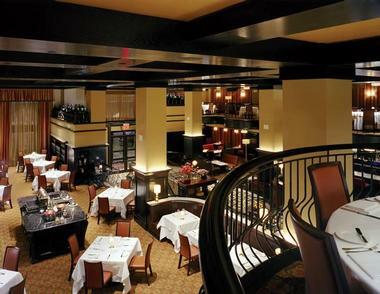 Co. offers a nice selection of wines and cocktails, soups, sandwiches, toasts, and breads. Transported directly from the Marais in Paris to bustling Chelsea in New York, Le Singe manages to be faithful to both places. The simple but classic décor of this charming bistro, authentic French fare, superb wine list, occasional live music, and large outdoor patio for people-watching makes Le Singe very popular among locals. It is the perfect spot for a happy hour drink or a bite to eat before going to a show, or for a first date over some delicious Steak Frites or Moules Marinieres. Le Singe is famous for its parties on special days such as Halloween or Gay Pride. Check their calendar for the next event. Small and bright, Pastai pays homage to Southern Italian pasta. Chef and owner Melissa Muller, who also owns nearby Eolo, offers hand-made fresh pasta prepared from scratch with seasonal ingredients in an open kitchen. There are about ten pasta dishes on the menu, as well as interesting antipasti, panini, and a few meat dishes. Breakfast dishes are available in the morning and for brunch. Try Asparagus Portobello Frittata with home-made ricotta; it is divine. There is an excellent wine list with Sicilian and Italian wines that will certainly please you. 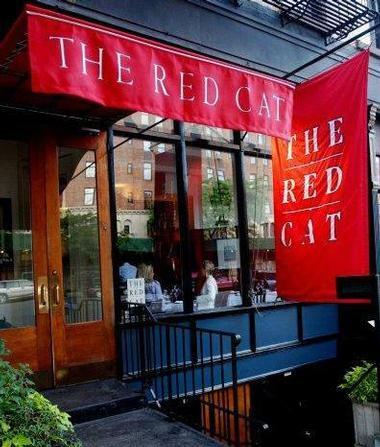 The Red Cat is the kind of neighborhood joint that every neighborhood needs – it is comfortable, cozy, and welcoming and serves great food. With colorful down-to-earth décor, vintage lamps, and rustic wooden walls reminiscent of a barn, the Red Cat has a steady local following, but the crowds that come to its bar show that the word is out. Owner and Chef Jimmy Bradley’s menu is fresh and inspired American-Mediterranean comfort food that he has brought to the 21st century. Try the grilled pork chops with a black olive and roast cauliflower puree or crispy sautéed skate wing with sweet-and-sour eggplant, and you will get the idea. The bar serves excellent cocktails, an interesting international wine selection, and mostly American craft beers. 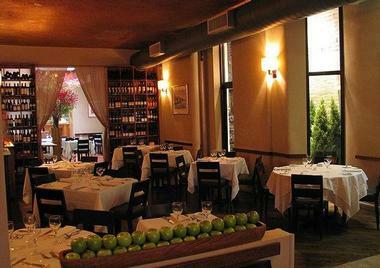 Elegant in its simplicity, Da Umberto has been one of New York’s favorite Italian restaurants for special occasions or a romantic dinner for two since 1987. The Assante family brings classic Tuscan fare to the 21st century by putting their own twist on traditional Tuscan dishes without sacrificing their roots. There is a lengthy list of daily specials that depend on what is fresh and in season. They are all incredible, especially Da Umberto’s inspired pasta dishes. The wine list is extensive and has some special regional Italian wines rarely seen. The portions are large, but try to leave some space for something from the dessert cart – you won’t want to miss it. Located in West Chelsea in the huge 1891 Waterfront New York Building, Porchlight is a charming amalgam of a Southern watering hole and a sleek New York bar with concrete floor, miles of raw wood, and old beams salvaged from the building’s basement. It is cozy, comfortable, and instantly recognizable. In the back there's a lively game room, and one corner has a porch with cozy couches and rocking chairs. The cocktails include classics such as New York Sour, Sherry Cobbler, and Behind the Mule. Their beer and wine lists are inspired and diverse. Chef Jean-Paul Bourgeois offers unexpected delights like the Tasso-and-Cheddar biscuits cooked in cast iron and Dirty Rice Croquettes with chicken liver. Tia Pol is a small cozy place serving some of the best tapas in New York, and you will recognize it when you see the crowds. The narrow space is lined with a long bar on one side and small tables on the other, so there isn’t much space, but nobody minds. The tapas, mostly Basque, are worth it. Try crunchy, savory croquettes that change daily, squid in its own ink served with rice, garlic, marinated lamb skewers, battered and fried shark served in little pyramids, and cod in any shape and form. The portions are small and reasonably priced, so you can keep sampling and enjoying to your heart’s content. Mokbar is a tiny Korean ramen shop in Chelsea Market, and you have to know where to look to find it. The long counter is lined with chairs where customers sit and watch the action in the kitchen, while the team dances the elaborate choreography common to all kitchens in a space replete with flavors, aromas, and steam. 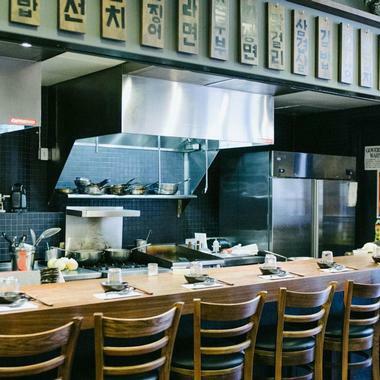 Mokbar combines traditional Korean flavors with fresh Japanese ramen noodles, creating a unique experience. 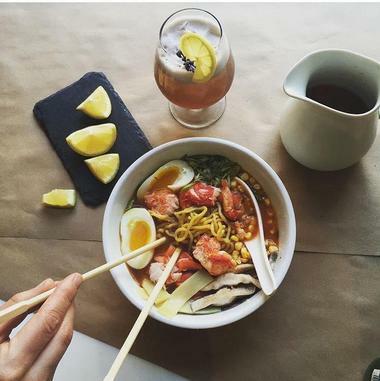 Chef and owner Esther Choi introduces a typical Asian custom of eating noodles on the go by selling her dishes as take-out. Dinner is offered at the counter. Some of the most popular dishes are delicious fried crispy ho cakes (pancakes stuffed with pork belly) served with Mokbar’s own orange kimchi sauce they make fresh every day, and,they have kimchi “kimchijigae” ramen with kimchi bacon broth, stewed kimchi, and braised pork and scallions, preferably topped with poached egg and pork belly. Small and unassuming with exposed brick wall, aesthetically practical furniture, and authentic Swiss-American fare, Trestle on Tenth is a popular neighborhood hangout where visitors frequently drop in on their way to a gallery opening or a show. Chef and owner Ralf Kuettel brings his childhood memories of the Swiss Alps, meadows, and forests and earthy home cooking to the Trestle on Tenth menu with dishes like pizokel (small dumplings drenched with melted Gruyere), crépinettes (flat sausages filled with braised pork shoulder), or veal kidneys in a creamy Trappist Ale sauce. There is a charming walled garden shaded by an old cherry tree in the back for al fresco meals when weather cooperates. Their extensive wine list has a nice mix of Old World labels, many of which are available by the glass. 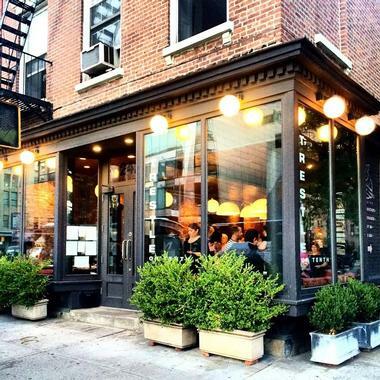 Restaurants in Chelsea: Co., Photo: Co.